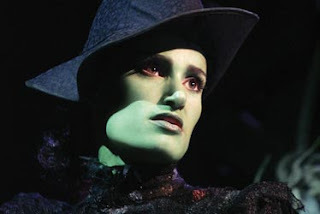 I’ve just finished reading Wicked for the second time and I’m so depressed. Part of it is because I like the feeling of having something that draws me into it, and now it’s gone. But it’s also the feeling of injustice that’s attached to it. And yes, I know it’s just a book, a story, that someone made up the whole thing, that those are not real people… But it’s a good representation of reality. That is what happen in real life, people don’t always get what they deserve. Some really amazing people hide behind these masks and no-one can really see them. Some people are seen as evil, vindictive, heartless… but is there something more inside them? Is that really who they are? Why they’ve become like that? It kills me knowing that a lot of people experience that pain Elphie represents. That more often than we’d like to believe people are discriminated and bullied and… hurt. And we don’t even realize it. Or we pretend not to. It is just a book, but the story is real and it shows us that no-one is completely good, just like very likely no-one is utterly evil. It makes you think how you act everyday, what’s your attitude towards people – different people. It opens your eyes… at least it opened mine. Things are not exactly how they seem and you have to take the time to get to know the person, the circumstances to make your own opinion about it. Be careful with first with first impressions, they can be deceiving. Give it a chance. Don’t just follow everybody else. Have the guts to be different, to be fair, stand up for it if you believe it and just try to be a better person everyday. A vida dá muitas voltas, nunca sabemos o que vai acontecer ou o que devemos esperar, contudo, hoje em dia temos cada vez mais tendência a esquecer-nos disso. Temos uma falsa certeza que podemos controlar tudo e que tudo está ao nosso alcance, se não for hoje será certamente amanhã… mal tal como disse são falsas certezas! Preocupamo-nos demasiado com coisas fúteis e sem grande importância e deixamos sempre para depois aquilo que realmente importa. Lamentamo-nos por isto ou por aquilo e esquecemo-nos que o fundamental da vida não depende apenas de nós. Não querendo ter uma visão pessimista da humanidade, mas já tendo, raras são as vezes que fazemos o acertado, pois na maioria dos casos ou não damos a devida importância às pessoas ou quando o fazemos é em relação às pessoas erradas. Às vezes não estamos dispostos a falar, outras não estão dispostos a ouvir-nos e ficamos neste impasse. Deixamos o tempo passar e as coisas ficam por dizer. Seguimos em frente como se nada se passasse e fosse tudo apenas um ridículo capricho que facilmente se pode ignorar. Estamos demasiado perdidos no mundo, ou até em nós mesmos para nos voltarmos a preocupar com o assunto e preferimos fingir que não houve oportunidade, preferimos ignorar a situação e fazer como toda a gente que se esquece de nós. Preferimos seguir a multidão e não nos destacarmos… Centramo-nos nos nossos problemas e preocupações e depressa tudo caí no esquecimento (mais fácil, pelo menos assim não há remorsos…). Mas depois um dia algo de inesperado acontece… a vida decide mostrar-nos que apesar de toda a tecnologia e avanço, no fundo, de pouco ou nada temos controlo. Um dia vamos acordar e arrepender-nos o resto dos nossos dias por não termos tido tempo ou disposição por dizer a toda a gente o quanto os amámos. Vamos ficar desiludidos connosco mesmos por apesar de tantos avisos termos cometido mais uma vez o mesmo erro que tantos já anteriormente haviam cometido, e vamos finalmente resumir-nos à nossa insignificância… chegando finalmente à conclusão que apesar de toda a nossa inteligência e superioridade agimos estupidamente durante 90% da nossa vida e focamo-nos em tudo menos no crucial. Vamos ficar revoltados, vamos prometer que dali para a frente tudo será diferente. Vamos recuperar e passado algum tempo faremos tudo errado novamente… porque o ser humano é assim, consegue por vezes manter na memória as mais insignificantes discussões ou momentos, mas o importante acaba sempre por se desvanecer. Don’t kick yourself down. It’s not as bad as it feels at the moment. It’s not worth the stress, the nerves, it’s done. Done and gone. There’s nothing you can do about it anymore. Don’t over react, don’t feel miserable about it. Trust me, you will have enough real reasons to feel miserable in life. You don’t need to make up some more. Don’t regret about what was done, just focus, get yourself together and make sure you do a better job next time. It has been tricky… Has you can tell by the date from my last post I have been wanting to give a new life to this blog. I stopped writing for a while because I started to feel that I was writing the same thoughts over and over again, just using different words. Also for a while writing was just one more way to help me to alienate myself from the rest of the world, from the rest of the people. I guess it got to a point that I associated so much writing with pain, because that was when I would write, that I decided to stop. Doing it was just one more way to focus on whatever I thought it was wrong at the time. In the beginning it felt good, I think I was needing that break but in a long run I started to miss it. I’ve always lived between the real world and the world of my thoughts and losing one of them felt like losing a part of me. I came to the conclusion that I need both of them… It’s all about balancing and knowing that though writing can be a good escape you can not let yourself go to deep. I’m still working on it, I am not going to lie… Also the whole idea of making all of this (or some of this) stuff public is kind of scary. I struggled a lot if I should do it or not but I decided to give it a go. I don’t know, sometimes it just helps when you listen or you read stuff from people that are having the same problems as you or feeling the same as you are, or just simply knowing that everybody feels like an outcast sometimes. So that was the main reason why I decided to put my things out there, because if it helps at least one person then it will be worth it. I hope I can stick with it, will see.